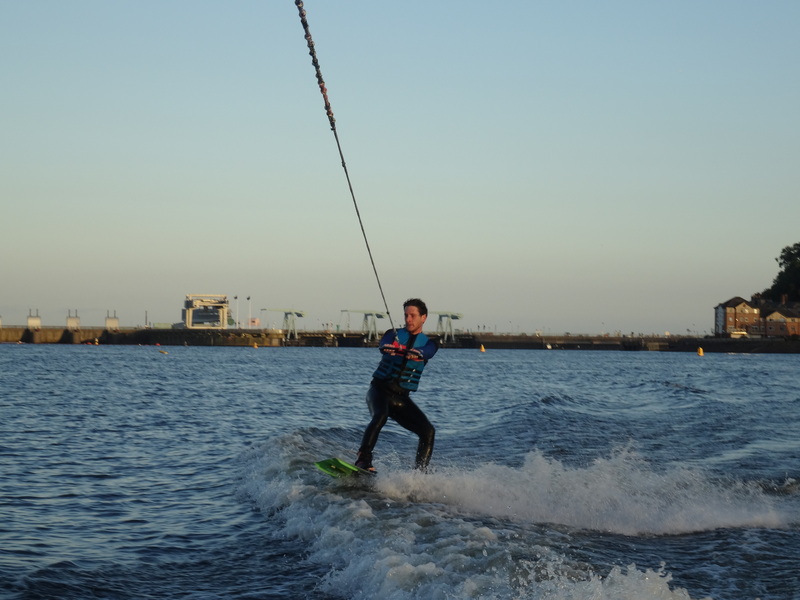 A few weeks back I blogged about how much fun I had wakeboarding in Turkey a couple of years ago, and that I couldn’t understand why I hadn’t done it again since. 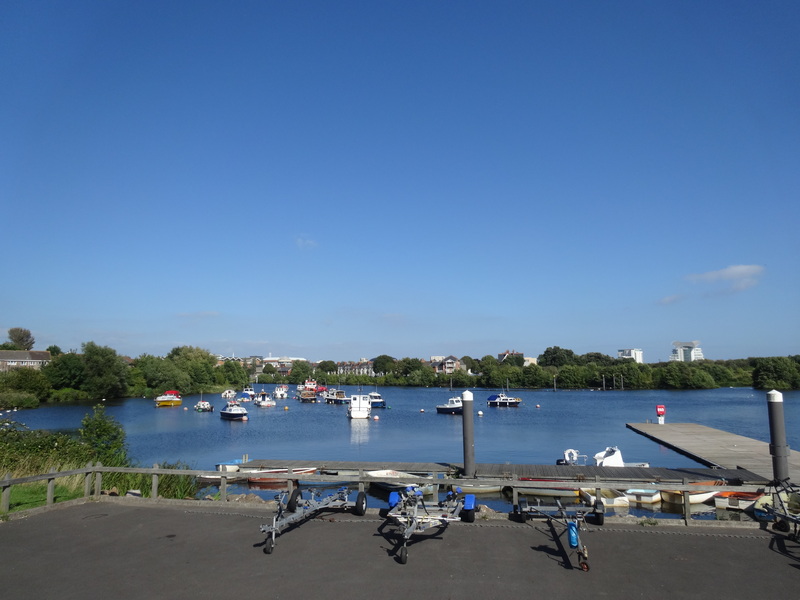 So, I got in touch with Penarth Waterski and Wakeboard Club to see what they could offer. 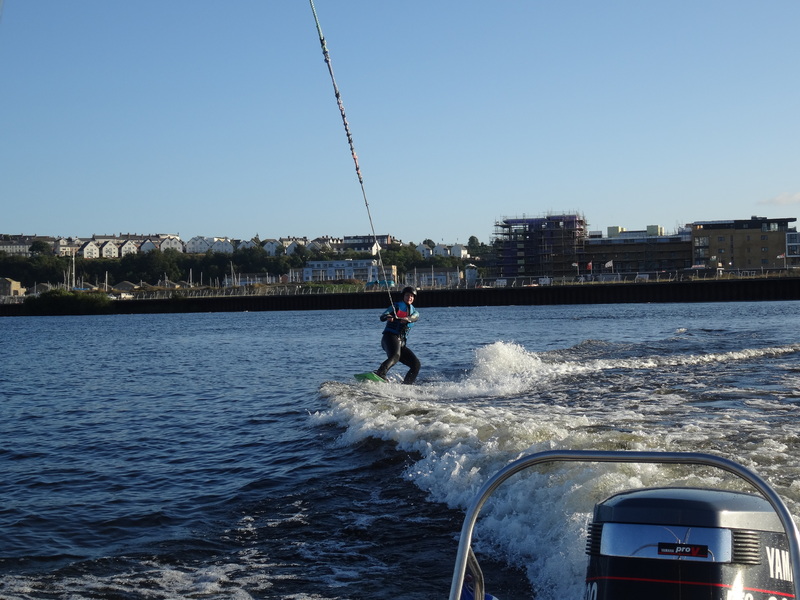 Cue a beautiful sunny Sunday in Cardiff Bay, two speedboats, and eight eager beavers wet-suited up for a taster session of either wakeboarding or water-skiing. For £25 you get two 15 minute long sessions. You definitely don’t get the feeling that you are being ripped off by a commercial enterprise, because you’re not – the coaches and drivers don’t profit. For tactical reasons, I chose to go last (less time being wet and cold – two things which make for an intolerably grumpy Suz). Olly and I had wondered whether we were going to be hopeless at it to start with, given the time which had elapsed since Turkey, but he got up on the rope straight away. A positive sign. Less positive when he attempted to jump the wake and caught his toe side, resulting in an almighty faceplant which was so forceful I actually thought it had knocked him out. No such luck (joke). He was fine. But our coach Kevin told us that he had been hospitalised recently for four broken ribs and an almost-punctured lung following a fall which wasn’t nearly as bad as Olly’s. My conclusion? I’m dating Iron Man. Then it was my turn. Looking like a peculiar seal in a helmet, I popped myself in the water with alacrity. Oh my, that was refreshing. I would have been better off in my winter wetsuit but the damn thing is so difficult to get on and off. 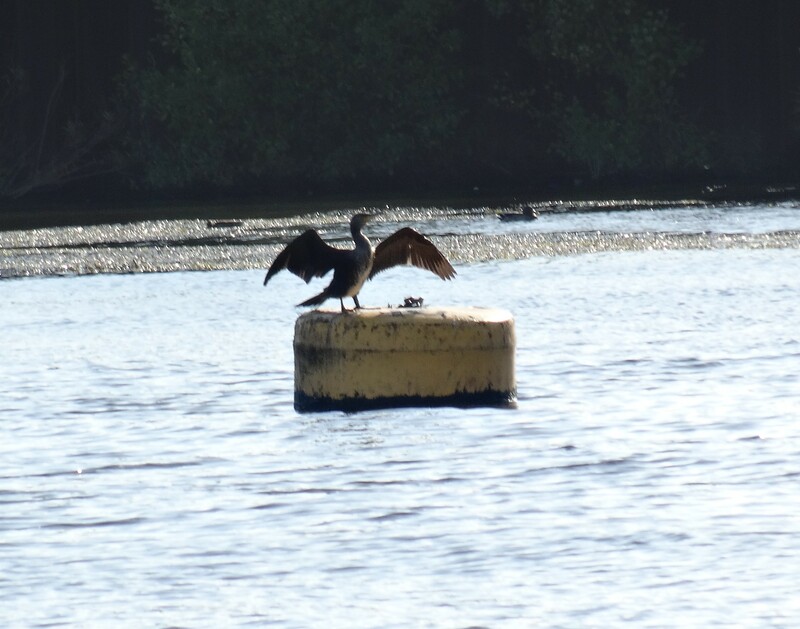 Anyhow, to my delight, I also got up on the rope first time, and it was a good few minutes before I first came crashing back down to water. If I wasn’t properly awake before, I certainly was after. 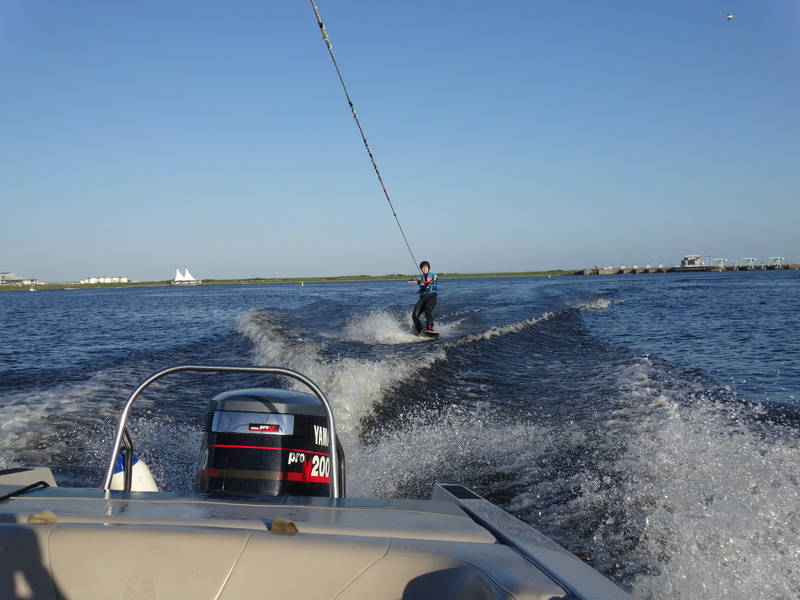 It felt pleasantly comfortable just messing about inside the wake, scooting over it to go out wide, and surfing the sides. 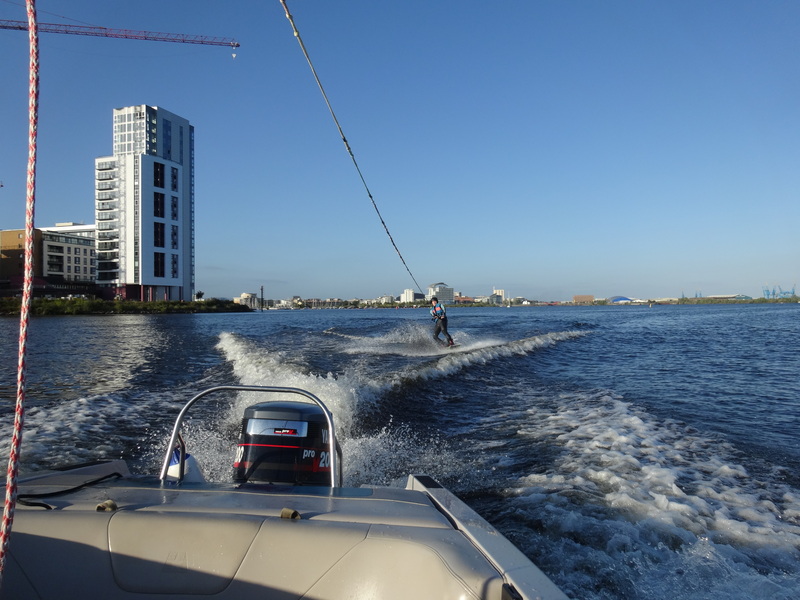 It really is a lot of fun, and you aren’t going so fast that you can’t enjoy your surroundings. Later, Kevin was happy enough with my ability to try a ‘switch’. This basically means switching your leading leg by turning your board 180 degrees in the water. I had done this in Turkey, but it’s such a bizarre, unnatural feeling. By the end of the session I had managed it a couple of times, so I left with a smile (albeit blue-lipped). The best thing about the day was that it made me forget, just for a little while, about the horrible stuff which has been going on in my life recently. 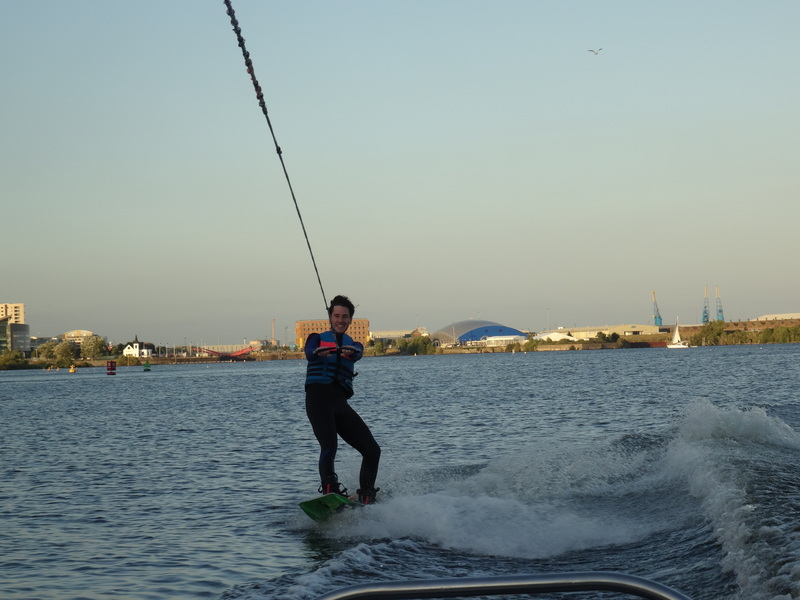 So, if you want a bit of active outdoors therapy, give wakeboarding a try!